“Those aren’t kids books,” a character insists early into Goosebumps, after his new companion shrugs off the YA source material of the film itself. “Those are the books that keep you up at night.” Anyone who cut their teeth on R.L. Stine’s hit series—a long run of paperback novellas, released at a monthly clip for the better part of the ’90s—can surely recall at least a few endless evenings spent under the covers, flipping pages by flashlight. But it wasn’t really raw terror that kept fans awake past their bedtime; the average Goosebumps book wasn’t so much frightening as powerfully addictive. They boasted tantalizing titles like Monster Blood and The Haunted Mask, colorful covers that teased the mild horrors within, and short, plainly written chapters, each punctuated by a cliffhanger. A whole generation of early readers—this writer included—lost sleep binging on regular installments. We couldn’t wait to get to the end, and then to crack the spine of the next one. Though it revives at least a dozen of Stine’s most popular beasts and fiends, the new Goosebumps movie rarely recalls the old preteen page-turners for which it’s named; millennials seeking a nostalgia trip would be better off scouring their parents’ basement for Stay Out Of The Basement, or at least cueing up an episode of the four-season Fox television series. This here is Goosebumps for today’s kids, meaning that the comparably quaint campfire tales Stine produced in bulk have been given a modern makeover—which is say, they’ve been replaced by the kind of noisy, frenetic amusement-park ride that now passes for all-ages entertainment. The model is Night At The Museum, not Night Of The Living Dummy. The film certainly begins like a Goosebumps book, with teenage reader/viewer surrogate Zach (Dylan Minnette) moving with his widowed mother (Amy Ryan) to Madison, Delaware, a peacefully picturesque community just begging to be set ablaze by alien invaders or swallowed whole by a gelatinous blob. The girl next door, Hannah (Odeya Rush), has a creepy father (Jack Black) who steals suspicious glances out of his venetian blinds and warns Zach to keep a safe distance from his daughter. What’s the cranky recluse hiding? Just as Goosebumps is hitting its Scholastic stride, things take a turn for Jumanji territory: Turns out Zach’s mysterious neighbor is none other than… beloved literary genius R.L. Stine, guardian of a Pandora’s library of original manuscripts. Once unlocked, his books unleash scores of monsters on the sleepy town. Goosebumps, in other words, takes place in a world where the Goosebumps series exists. It’s a cute idea that the movie mostly employs as an excuse to turn Stine’s greatest hits—a lumbering yeti, a mischievously invisible boy, an army of lawn gnomes wreaking havoc in a kitchen (à la the gremlins of Gremlins)—into a string of CGI attractions, going “boo” and then going away. It’s all very carnival funhouse, as director Rob Letterman (Gulliver’s Travels) rushes from one slapstick, PG-rated chase scene to the next, pausing occasionally for a laugh line by comic-relief ringers like Ken Marino and Timothy Simons. The film’s stabs at meta humor are more entertaining, with Stine written as an eccentric wordsmith who hates being compared to Stephen King, routinely forgets the plots of the books he’s churned out, and eventually explains that every story contains three parts: “the beginning, the middle, and the twist.” (Only these offhand gags remind a viewer that the authors of the film’s story, Scott Alexander and Larry Karaszewski, wrote not just Agent Cody Banks and That Darn Cat, but also Ed Wood.) Meanwhile, Jack Black plays Stine as, well, a Jack Black character, throwing temper tantrums with a Tenacious D accent. He also does a halfway decent Cryptkeeper imitation to voice malevolent marionette Slappy, who the film conceives of as Stine’s raging id, pulling the strings on the whole monster mash. Again, none of this bears much resemblance to the author’s line of kid-centric potboilers, which seem like models of classic suspense compared to the blockbuster hijinks on display here. Squint hard enough and it is possible to see the phantom impression of an Amblin entertainment, especially given the Spielbergian dead-daddy backstory Zach’s provided. But drawing that parallel only underlines how sanitized, how danger-free, family films have gotten in the two decades since Stine’s bestselling heyday. (It’s the type of movie that insists on showing us that the high-school bully definitely survived his run-in with a giant praying mantis, lest anyone assume that even a single soul perished in the supernatural rampage.) 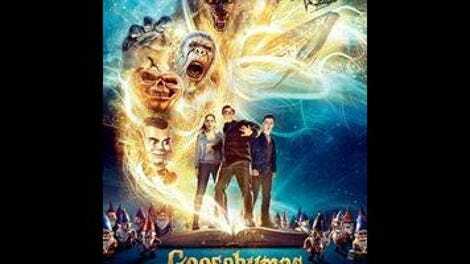 As effects-heavy time-wasters go, Goosebumps is mostly harmless, even sporadically amusing. But it isn’t likely to keep anyone up at night, out of fear or excitement.